165 mm/45 Mle 18938 х 1 pcs. Initial HE Shell Velocity770 m./s. Initial AP Shell Velocity770 m./s. 8 mm Mle 19146 х 1 pcs. 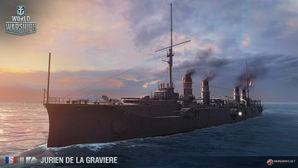 Jurien de la Gravière — French Tier II cruiser. Jurien de la Gravière was the last protected cruiser built for the French Navy. The ship's silhouette and architecture were typical of French warships at the turn of the 19th century. Powerful 165mm guns distinguished Jurien de la Gravière from the majority of foreign counterparts. Large guns and heavy armor put the Jurien de la Gravière at the top of her tier in terms of sheer force... at least on paper. Unfortunately, actually playing her a frustrating experience due to her slow speed and slow reload, the latter made worse by her abysmal accuracy. Placed alongside her peers at Tier II, Jurien is fairly mediocre. She has average speed, rudder shift time, detectability, and health pool. The big differentiation between Jurien and all the other Tier II cruisers in the game is the size of her guns. Jurien wins that category hands down, mounting 165mm rifles mounted in a mixed configuration (some along the centerline, some not). As a result, her shells pack some of the biggest punch captains will find in low tier cruisers; unfortunately, her overall damage output is hampered by long reload times and so-so accuracy. Jurien is at least better than Bougainville, but she's not really a stand-out at Tier II; that honor is reserved for Tier III's Friant. Citadel top and sides are heavily armored and below the waterline. Large-caliber guns for its tier. Horrible accuracy; shells frequently over- or under-shoot. Infuriatingly slow at only 23 knots. Main battery range is the greatest weakness of Jurien de la Graviere, so players will likely want to research the Fire Control Systems module first, saving the hull module for last (on their way to Friant). Like Bougainville, Jurien has only one upgrade slot. Captains should equip Magazine Modification 1 ( ) or Main Armaments Modification 1 ( ) for the limited time they'll play the ship. Jurien de la Gravière was the only ship of her class and last protected cruiser built for the French Navy, named in honour of Edmond Jurien de la Gravière and his father, Pierre Roch Jurien de La Gravière. After she was commissioned, she served in the Far East until she was called back to Europe after the First World War broke out. She served in the Mediterranean during the war, patrolling the Strait of Otranto, repressing insurrections in Crete, and bombarding Turkey. She took part in the blockade of Greece after the Noemvriana events in December 1916. She was decommissioned on 27 July 1921 and was sold for scrap in 1922. This page was last modified on 13 March 2018, at 15:51. This page has been accessed 12,861 times.